Victoria's Secret PINK has such cute sports apparel for women! 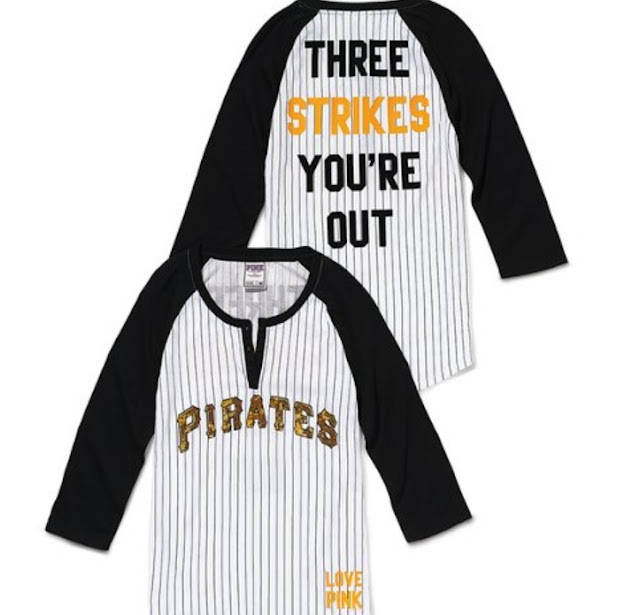 I picked up this Pittsburgh Pirates shirt from their new MLB 2012 Collection! The Buccos have been terrible for the past two decades (their last winning season was when I was about 6-years-old) but as a Pittsburgh sports fan, you put on the black and gold and support them anyway. The Pirates may not be champions like the Steelers or Penguins but they do have a really nice stadium and lots of fun tailgates- and who can complain about the fireworks? Take me out to the ball game!